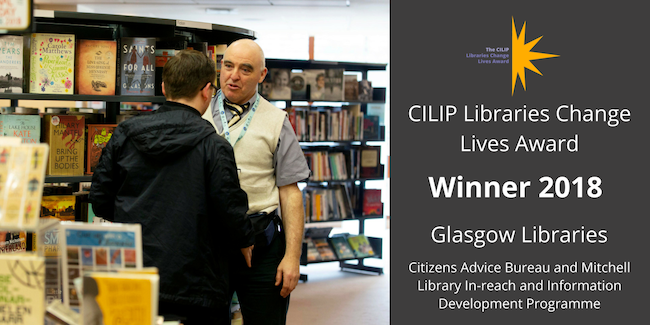 Glasgow Libraries have won the CILIP Libraries Change Lives Award for their innovative work supporting people experiencing homelessness with the In-Reach project. This project was developed in partnership with Glasgow Central Citizens Advice Bureau (CAB) to provide counselling, support and advice to people affected by homelessness in Glasgow. The award was presented by Lord Graham Tope, CBE, at the CILIP AGM during Libraries Week. Along with the award, Glasgow Libraries has received a £4,000 investment from CILIP to continue their innovative work. Click here to read the full press-release from CILIP and learn more about the project or watch the video below.